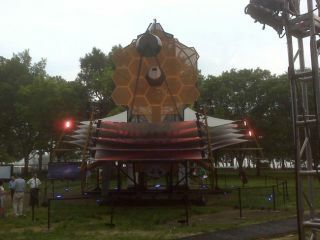 A full-scale, tennis court-sized model of the James Webb Space Telescope. The replica was on display in Battery Park in New York City as part of the 2010 World Science Festival. A senator, a former astronaut and three Nobel prize winners are joining the deputy administrator of NASA in Baltimore today (Oct. 26) to discuss the James Webb Space Telescope project, often called the Hubble telescope's successor. The speakers will hold a press conference to mark the end of a 13-day display of a full-size model of the James Webb observatory at the Maryland Science Center. The model was on view as part of the recent Association of Science-Technology Centers (ASTC) annual conference held in Baltimore. ASTC is a nonprofit organization of science centers and museums dedicated to furthering public engagement with science among increasingly diverse audiences. The Webb telescope will provide images of the first galaxies ever formed and explore planets around distant stars. The ambitious observatory is a joint project of NASA, the European Space Agency and the Canadian Space Agency. John Mather, recipient of the 2006 Nobel Prize in Physics and Webb telescope senior project scientist at NASA's Goddard Space Flight Center in Greenbelt, Md. If you're in the Baltimore area, you can visit the museum at 601 Light Street in Baltimore's Inner Harbor.